Originally posted on NREL. Also available on Solar Power World, Solar Industry Mag, pv magazine. How long a product can be expected to perform at a high level is a fundamental indication of quality and durability. In the solar industry, accurately predicting the longevity of photovoltaic (PV) panels is essential to increase energy production, lower costs, and raise investor and consumer confidence. A new software package developed by the U.S. Department of Energy’s National Renewable Energy Laboratory (NREL) and industry partners SunPower and kWh Analytics is making the measurement of PV system expected lifetime performance more reliable, consistent, and accurate. 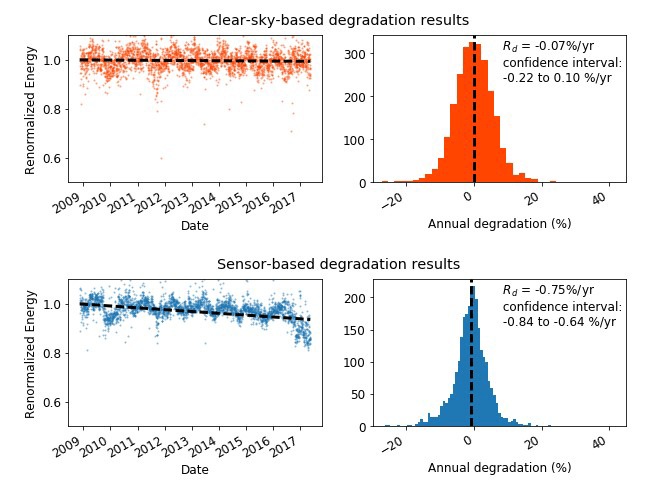 RdTools results show time-series data along with a year-on-year degradation distribution. The same system is analyzed with the clear-sky method (a), and sensor-based method with a poorly maintained sensor (b). In this case, high reported degradation is likely caused by sensor drift, rather than a degrading PV module. This all sounds great, but you’re new to magical beanstalks, and as an investor you need to weigh risk versus opportunity. How many of the plants die each year? Which species of magical beanstalk is the most reliable? What happens to your investment if the USDA changes its rules? Farmers claim that the investment is safe, but you’re getting spooked, and the important data — the data for your underwriting model, such as annual yields, geographic variance, death rates — just isn’t being shared. You wonder: Are they hiding something? Of course, this story is an allegory for the solar industry. To the outside world, we are the growers of magical beanstalks — we literally generate value from the sun — and still the new kid on the block in the finance world. Just look at how we are classified: solar falls within the “esoterics” category for securitizations right next to rail cars, cell towers, and drug royalties. When faced with uncertainty, data is a pathway to understanding and acceptance. Without data, we see investors either avoid the market entirely or severely “haircut” the cash flows needed to meet their return. For example, the average advance rate for solar securitizations is 75 percent, compared to 92 percent for autos and 99 percent for mortgages. Data opacity also results in conservative assumptions: Kroll assumes 0.75 percent annual degradation and stress-tests cash flows at a 1.2 percent degradation rate.